Start-Up Aging Life Geriatric Care Management-Have an Operational Design??? On Memorial Day, we honor those who died in American wars. But let me tell you a story about vets who lived – with the the mental and physical wounds of combat. My father was World War II navigator shot down in Poland and transferred to Stalag-VII-A Moosburg Bavaria. He returned home a broken man with PTSD , He never took a bus, drove a car or flew on a plane again for 50 years. His disability, went untreated 50 years. He worked as an advertising agent ala Mad Men, and drank like Don Draper. Our family crumbled into a dysfunctional maelstrom, as most families of “wounded warriors” do without help. Like most World War II vet he never sought help. They believed they fought the “good war”. After my mother died, followed by my brother’s death, I talked him into getting help through the VA. But the “the perfect storm” of 1989 flooded his whole house, just like Hurricane Sandy did again after it was sold. We lived on the bay off the Jersey Coast, since devastated by the rising ocean. On the Christmas Eve we got him an emergency flight to California with only his clothes and he moved in with us for 20 years, until his death. Was it a good move-? It was a great move for us as a family and him as a PTSD riddled vet. He became the center of our family, transformed the distant removed father he had been. The great grandchildren and my children adored him and he loved them back. He was “Pop”. This healing was in great part because of the the VA GRECC program . I got him enrolled in VA Palo Alto GRECC program and they took care of his heath for 20 years ,with the unmatched expertise of the VA program for aging vets. I cannot say enough about what a great service GRECC rendered him. After 50 years of no help, they showered him with superb preventative care, top-notch geriatricians, transportation, and financial support and at the end home care until he died. So on Memorial Day I would like to offer you my own journey with a veteran and remind you of the horrible struggle that living untreated veterans can go through- salted by the anguish visited on their families. One of the most remarkable parts of the VA is it’s GRECC program. So happy Memorial Day Dad and all families of veterans. This is a time to honor the dead and treat the living. Join a free closed Facebook group to start up or grow an aging life or geriatric care management agency. If you want to be launch or expand an aging Life or geriatric care manager agency —and really do not know where to start- I have the answer. I facilitate a daily confidential closed Facebook group for all start up and practicing Aging Life or geriatric care managers who want to run a successful care management business. Along with any business or clinical consulting, operations manual that you order, you automatically are invited to join in a free confidential closed Facebook group that I facilitate. I answer all questions plus you get to interact with over 20 other start –up Aging Life or GCM’s from all over the U.S.
You can learn from an expert in the field plus and the group/peer virtual interaction. You will join new professionals sailing in the same boat through big surf – towards the calm of profit insuccessful aging life or geriatric care management business. 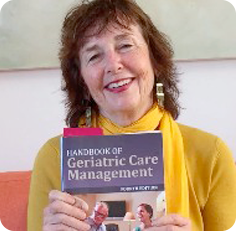 I am the author of the Handbook of Geriatric Care management now out in the 4th edition. My book is called “The bible of care geriatric care management and is used in gerontology classes all over the world. You can check out my 1-1 training clinical or business training , GCM Operations manual for as little as $300 a month payment plan – With any of those products plus you get to join the interactive closed Facebook group I moderate daily FOR FREE. You can reach me anytime through this group. Do you work with the aging family? If you are a case manager, aging life care manager, geriatric care manager, elder care manager or teach geriatric care management or elder care- you need to have the tools to work with the family. One of the only books that cover how to work with the aging family is out now on Kindle. Care Managers Working with the Aging Family can now be rented, bought as a hardback and now purchased on Kindle. This makes it cheaper and easier to offer to students. In fact you can get a free instructor’s copy if you are a teacher.